Starring: Amy Adams, Jake Gyllenhaal, Michael Shannon, Aaron-Taylor-Johnson, and more. Requested review from Kimberly Thomas! A movie has the capability to cause a viewer to feel and see things in so many different ways. Some movies can be dry, boring, and/or not challenging in any way. Say, a raunchy comedy or cheaply made animated flick. Or a movie can be challenging, thought-provoking, and/or immersive as possible. Also, of course, then there is the large range in between those two points where movies can fall. 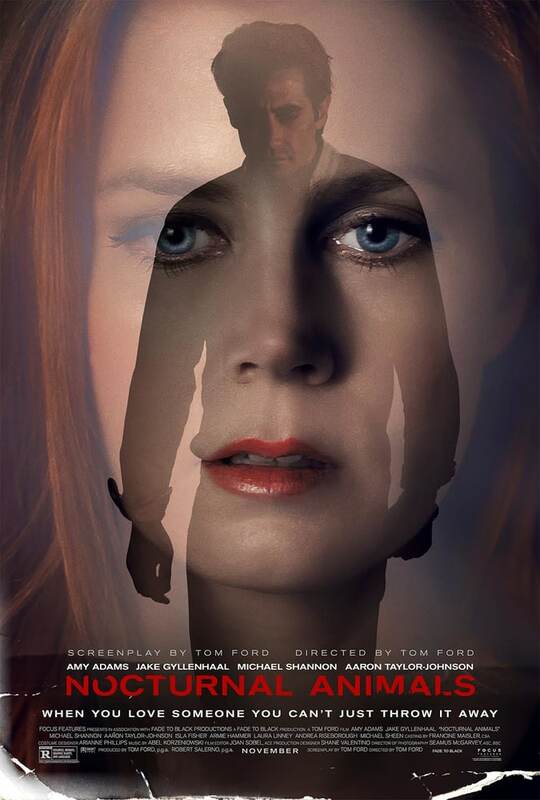 This review focuses on a title directed by a man who is quoted to say, “If you spend an hour and a half in a movie theater, it should challenge you.” That man is Tom Ford and here we have a review on his film, “Nocturnal Animals”. Susan Morrow (Amy Adams) is a successful art gallery owner who although lives in luxury and among the top of the food chain, she is ultimately unhappy with her life. While going through the motions of her top notch life, she receives a package from ex-husband Edward (Jake Gyllenhaal) containing his recently made novel which is inspired by Susan. From this point on, we as the audience experience the story Edward wrote, Susan’s current life, and Susan’s earlier life with Edward, simultaneously. ‘Nocturnal Animals’ was enthralling to say the least. Curiosity took over me from the very get go of this film and truly has not ended even as I sit and type this review up. And if you have not gathered this conclusion yourself, this is a very good thing from my point of view. I love films that can keep a viewer guessing and curious throughout its duration and especially love when it continues to keep you thinking long after one has left their auditorium. Tom Ford and company has done a phenomenal job with this piece and I am applauding at what this film has turned out to be. The execution of three different story lines was done flawlessly. Once I was immersed in what was happening in one story, I was plucked into another one, leaving myself confused then immediately invested in what was newly occurring on screen. This may leave some permanently confused or some may dislike this style but regardless, when it is boiled down, this film does it in perfect fashion… The debate may go on forever on what actor or actress was better in this film but everyone was truly top-notch. I personally was impressed with Aaron-Taylor Johnson and Jake Gyllenhaal. Aaron-Taylor Johnson plays Ray Marcus, an unpredictable and terrifying character. His performance without spoilers is simply just remarkable. Jake Gyllenhaal has a knack for performing excellently with characters placed in a dark and scary place. His character of Edward/Tony is full of emotion and I personally felt the despair he portrayed his character having. Overall, just a fantastic performance by these two as well as the entire cast. To this point, I am still researching this movie. Gathering my own opinions and conclusions. Trying to understand the motives of characters and figuring out the symbolism behind many different occurrences within it. ‘Nocturnal Animals’ is a fantastic piece of film. A film that can keep an audience curious and wanting more or maybe leaving some members of said audience angry and upset with what they have watched. Regardless of where you may fall, this film can be difficult, it could be confusing, but at the end of they day it is brilliantly done in any way you can think.